Five for Friday! 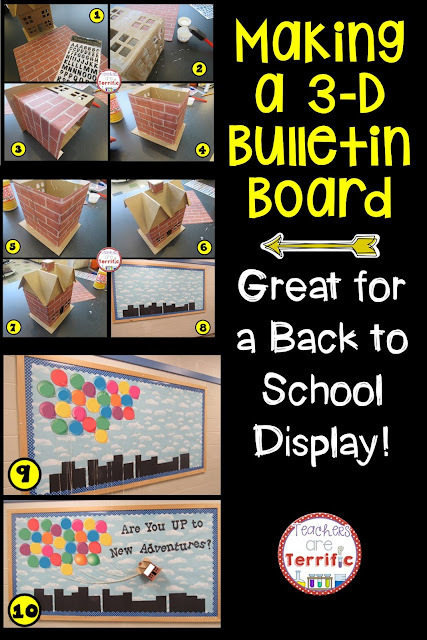 Another Bulletin Board Edition! Well, it turns out I am now the bulletin board queen at my school. Let me explain more in this edition of Five for Friday! So, I had to do one in the hallway! And I had this idea I totally swiped from a Pinterest pin. 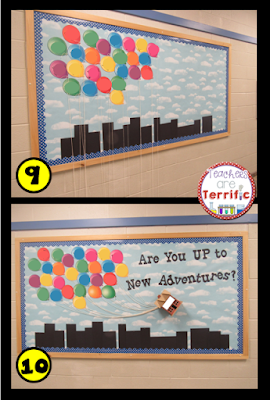 It was a board using the balloons and little house from the movie "Up". Well, I tried to make the little house of paper. It was hopelessly not dimensional and quite ugly. So, I went to Hobby Lobby to get brick patterned scrapbook paper. I found that and some corrugated brown scrapbook paper and I was going to make a new house from that, but you know, when you are in Hobby Lobby you have to wander around. And then I found myself staring at these pressed board houses. Just look at the pictures below! 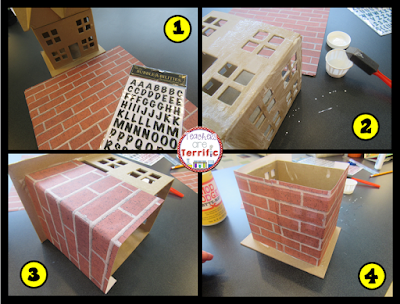 1- Gathered supplies, which included the little house, brick paper, and press on letters. 2- Paint the front of the house with mod podge (which is really just white glue with a fancy name). 3- Press the brick paper into place and smooth it out. 4- Repeat this until the little house is wrapped in brick paper. 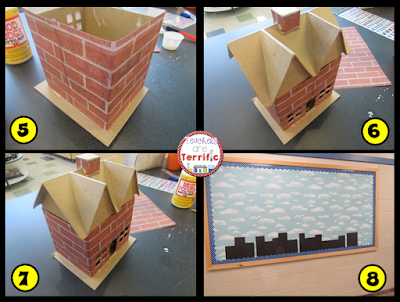 6-7 - Use strips of brick paper to wrap the chimney and then glue the top onto the little house. I also added a title to the house with the stick on letters. I just took white paper, stuck on the letters, glued that to a black background and glued it to the front of the house. Since it is the name of my school I left it out of the photos! 8- Staple up cloud background paper onto the bulletin board. I actually purchased this cloud paper, so it was super easy. You could just use blue and glue up some white paper or smear it with chalk. Add the black rectangles as an imitation skyline. I just cut paper into many shapes and stapled it up! 9- Add balloons. I purchased this pack of balloons already made to save time. The balloons have all of the teacher's names in my school, but you can't see them (I cleverly disguised them with little circles!) I attached strings to each balloon and then gathered the strings into a bunch and stapled that in place. 10- The house was added with hot glue and duck tape. The words have since been changed to say "Are You UP for New Adventures?" and I also added "Let's Do It!" I know! It's too cute. You can see why I am now Queen of Bulletin Boards. I blogged about this one last week, but I did change it slightly. So, I just moved the posters over. I love it! You can't tell from the photo, but this board is 7 feet long. Actually, all the boards in this post are the same size. The two turquoise colored ones are painted that color. Most of us in my school painted our boards a few summers back and now we never have to hang paper on them! Anyway, for the one above I taped together two 12x18 pieces of black construction paper. The word STEM is just giant white letters made from the font "Jokerman". Recognize it? I just used my projector and computer and enlarged it until it fit the paper, cut it out and stapled it up! The rest is just die-cut letters and black ribbon. I have no clue what I am going to put in the empty space! I kinda like them empty! 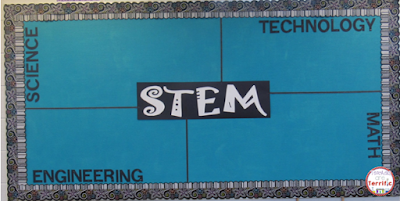 Are you trying STEM yet? Part 1- So, Are You Thinking About STEM? And, just because it's also an easy read, try last week's post about the Supplies You need for STEM that can purchased at the Dollar Tree! Last, but not least, are you a Teacher's Pay Teacher's Seller? If you are, then do you ever check your ranking on the seller's list? Your name can be hard to find, but Colorado Classroom has made an app to help you! Wow! You are the bulletin board queen! I switched from the classroom to ESL and I think my biggest relief is not having to do bulletin boards. I used to be so stressed out about them! What's Going on in Science Class? Boats! The Easiest of Materials- Paper Chains! 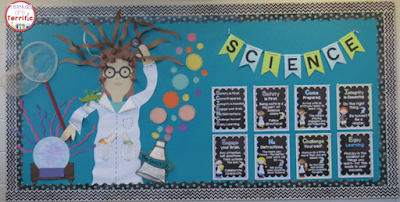 Mad About Science Bulletin Boards!